The theme launch was held on 11 January 2015. To make greater, to make stronger or larger, expand, enlarge, exaggerate, increase, extend, escalate, multiply. It is the process of increasing the magnitude of a variable quantity specially the magnitude of voltage, power or current without altering any quality. "Once you turn the volume of a speaker, it increases the volume of the sound. Once you increase it, you amplify this sound. You increase the sound and automatically a larger area is covered; it is not contained. And we cannot hide it. We must turn on the sound, extend it, increase it, make it reach farther!" There something in all of you that will cause you to erupt like a volcano. What is an object in life that you can amplify? Time for action: “And the Lord said to Moses, “Why do you cry to me? We must look into what is in your life that we can spew out and amplify. 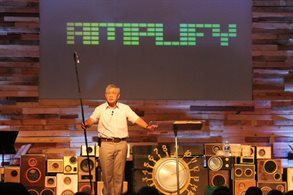 What is in your life that you can amplify so that people will know and see the sign, chosen by the Lord to minister the gospel and the love of Jesus? 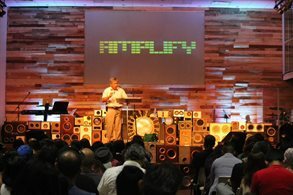 It is the Lord Jesus who will AMPLIFY... not you or me.